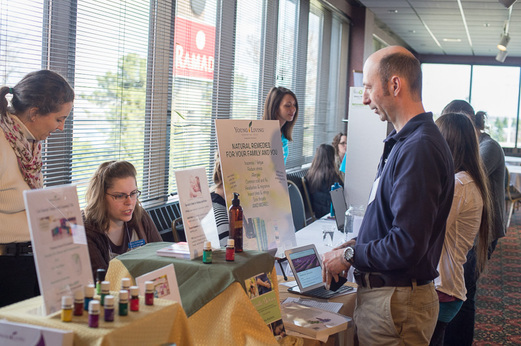 We invite local businesses, non-profits, government agencies and craft sellers/artisans to set up a table in our Exhibit Area and Boobtique for our two-day conference Friday, April 15th and Saturday, April 16th, 2016. Please note that meals times are one of the main times during the day when attendees will be walking through the Exhibit Hall so your table will need to be staffed during meals. Please review all the policies below, especially the information under "Contract Agreement." If your organization meets these guidelines, please fill out this form and send it to the address on the form, along with your payment. If you are unsure whether your organization will meet the requirements, please email Anne. All exhibits must be compatible with La Leche League International (LLLI) principles and policies and in adherence with the World Health Organization (WHO) International Code of Marketing of Breast Milk Substitutes. The exhibits should be of some value to (most) people attending the Area Conference. 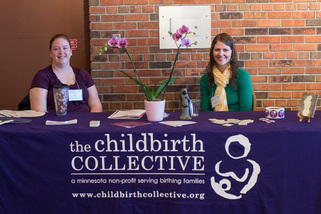 Exhibits should not be obtrusive or detract from the primary purpose of the conference, which is to reflect good mothering through breastfeeding. Exhibits accepted previously may become unacceptable due to changes in LLLI policies and/or philosophy. The ACEA (Associate Continuing Education Administrator) will have final approval of all exhibitors. An organization that advocates a particular procedure, method, or system related, however vaguely to health must have express, written permission from La Leche League in order to exhibit. Acceptance of an exhibit does not constitute an endorsement by LLLI, LLLUSA, LLL Alliance for Breastfeeding Education, or the Area. A disclaimer to that effect will be printed in the conference Program Booklet. Materials approved for an LLLI Conference or by LLLI may not necessarily be approved for an Area Conference. Exhibitors are required to submit a detailed list of items to be exhibited and/or sold. Samples may be requested at a later date. A copy of all printed materials (e.g. brochures, catalogues, flyers, etc.) for each exhibit should be reviewed by the ACE and/or the ACL. The ACE will preview the exhibit hall prior to the first time the exhibit hall is open. Exhibitors will be asked to remove any items, products, or materials that were not pre-approved or deemed inappropriate. Items competitive with the Area Conference Bookstore or items on the LLLI Web site may be rejected solely because of the competition. LLL does not guarantee sales to any exhibitor. Note: All exhibitors must meet the deadline listed on the exhibit contract. An exhibitor’s products and/or literature may be rejected for lack of appropriate approval time. The exhibit fees will be returned if the exhibit is not approved. LLL reserves the right to regulate or prohibit any exhibit and/or materials deemed inappropriate or unacceptable. The exhibitor contract form must be signed and returned to LLL and all fees must be paid in full prior to the opening of the conference. The exhibit fee is noted on the contract form. LLL must have the names of the personnel who will staff your exhibit. An official conference name badge will be required for all who enter the Exhibit Area. Exhibitors must pay a registration fee to participate in meals (offered Friday only). Extra meals may be purchased for an extra charge for those not attending the conference sessions. Exhibitors shall not schedule private functions during the conference hours. LLL reserves the right to limit or prohibit prize drawings or contests, distribution of items and any “extreme” promotional activities. In all cases you must obtain written permission from the ACEA. LLL will make every effort to assign table locations according to exhibitor preference. Priority is determined by the order in which applications accompanied by payment in full are received. LLL will attempt to separate exhibits of similar products and/or services and will try to honor your request if you do not wish to be located near a specific organization or product. However, LLL cannot guarantee such spacing.